Over the years, in this little corner of the internet, I've written almost 2000 blog posts. That's a lot of words, and ideas, and random thoughts, and lots and lots of waffle... I have no clue how many different directions I've taken with my ramblings. 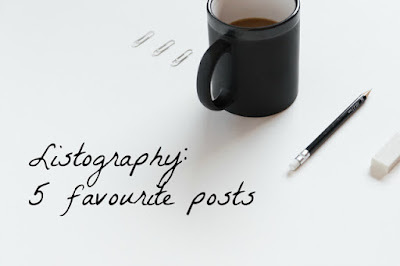 So when Kate resurects Listography and asks contributors to pick their five favourite posts written by themselves, I start to panic. As I'm writing this opening paragraph I have twenty-seven tabs open with blog posts that I (a) enjoyed writing and (b) are still relevant now. How on EARTH do I narrow that down to just five? 100 Words was a series inspired by Mr London Street (blog no longer public) and endorsed by Her Melness (now blogging at What Mel Did) and I dabbled a bit to practice my creative writing. None of the attempts are noteworthy but the emotions in this post still ring true today. I find writing monologue style really suits the way I tell a story. I want you, the reader, to be there with me, experiencing the situation in the same way I have. This minute-by-minute update of our new boiler being fitted was the first time I attempted this style of writing. Just some thoughts about my own tattoos, other people's tattoos, the reasons for inking your skin, the permanence (or not) of it all and everything else in between. There's no way I could curate this post and leave this one out. Another self-depreciating write-up but it still remains one of the most stupidest things I have EVER done. If you've been here for a while I'd like to know if you'd have picked any of these as your favourite? If not, which one would you have chosen for me to share? If you're a new reader of the blog, which post did you read first? What made you stay?